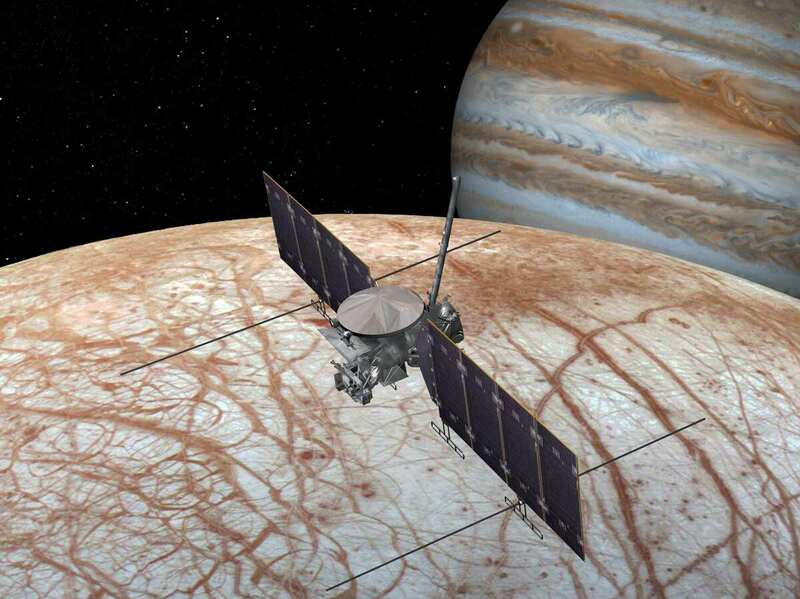 Cassini's Discoveries Make Way For NASA Probe Of Jupiter's Europa Moon : 13.7: Cosmos And Culture Following on Cassini's discoveries, NASA aims to probe Jupiter's Europa for potential life. With every new world we discover, we should look back at our own planet with awe, says Marcelo Gleiser. An artist's rendition of the future Europa Clipper probing Jupiter's moon Europa for potential life. Titan is a hazy ball larger than Mercury, the only moon in the solar system with an atmosphere. Using infrared cameras, Cassini was able to peer through Titan's nitrogen-rich atmosphere to discover massive lakes of liquid methane and other carbon-rich compounds. Cassini released the Huygens probe into Titan to take in details of its atmosphere and surface. Amazingly, it found mountains and canyons carved by liquid methane and a surface punctuated by rocks. No two worlds are ever the same; but there are general features that repeat across the solar system if liquid is allowed to flow and hasten erosion, while exchanging heat with the atmosphere. Although extremely cold, Titan is a model for an alien environment, rich with a dynamic atmosphere-surface energy exchange. Enceladus was an even bigger surprise. Beneath its frozen surface lies an ocean of water, warmed by Saturn's gravitational pull. (Think of a ball of Play-Doh and how it gets warm if you keep squeezing and stretching it.) Near Enceladus' south pole, Cassini found huge geysers that shot water into the atmosphere, releasing the heat from the moon's insides. If you scroll down the Times' photo gallery, you can watch a movie of a geyser erupting. But Cassini's scientists wouldn't just take pictures. They maneuvered the spacecraft to fly through the plumes to collect samples of the erupting vapors. Chemical analysis found water vapor, carbon dioxide, methane, molecular nitrogen, propane, acetylene, formaldehyde and traces of ammonia, all chemicals related to life. This discovery propelled Enceladus to the top of the list of worlds where we should search for life. No need to drill through the surface into the underground ocean; just fly through the plumes and collect samples to search for some kind of simple life form.